Use of Braille survives today because for the blind it is an only and unavoidable solution for Literacy. This is because of the high production costs and vast volumes of braille-based educational material. But this will become possible only if Technology provides Refreshable Braille Solutions that are inexpensive and easy to use. The NRBD will come in models priced downwards of US$ 200 where existing commercdial models cost upwards of US$ 2000. The dramatic drop in cost is due to an innovative design of elegant simplicity. The NRBD uses a building block comprised of a cheap flat octogonal plastic disk with solid dots formed on its eight edges simulating all the eight possible dot patterns of a column of a braille cell. A pair of disks rotated against each other around a spindle across their centre. This enables a pair of adjacent edges to successively present a full cell of two columns with dots in any of the full set of braille codes. THIS BUILDING BLOCK IS CALLED THE NATESAN DISK. 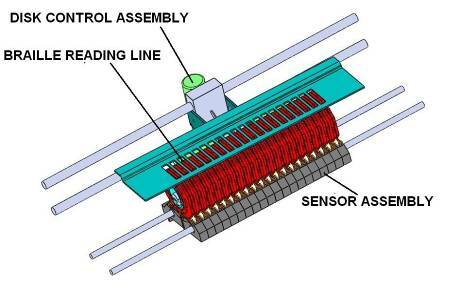 The simple manual Natesan Display shown at the bottom of the last slide suggested possibilities of adapting it for electro-mechanical operation under electronic control. 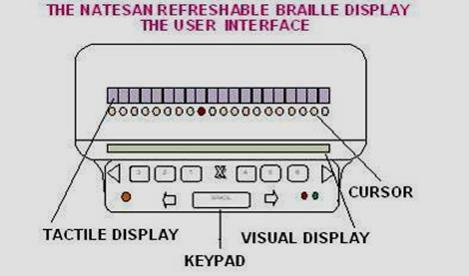 This idea resulted in designing and making the full-fledged Natesan Refreshable Braille Display (NRBD). audio feedback for data entry and navigation. and retrieval from USB pen drives. 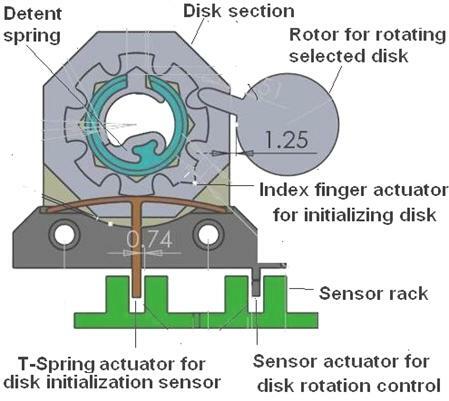 support from a PC (to be provided in later models). Clock Mode : To display Date and Time. The entire unit is self-contained, Microprocessor controlled It operates from a rechargeable battery or from mains power. THE UNIVERSAL EDUCATION KIT (UEK). The Natesan Refreshable Braille Display will now form a critical part of our next basic solution, the Universal Education Kit (UEK), that provides the equipment requirements for the effective teaching of the full range of all school subjects to blind children. The UEK is a combination of I.T. hardware and software built on principles of Universal Design that will enable all children, able or disabled, to be able to use the facilities across language and disability. 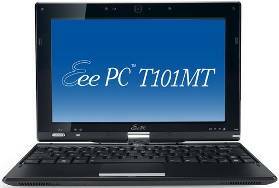 Peripherals : Remote Keyboard / Touchpad, Tablet, Speakers & Headset, Projector & Screen, Inkjet printer, Scanner, Brailler, along with the Natesan Refreshable Braille Display. Miscellaneous : A small stock of MP3/Daisy Players and Recorders to be made available for being borrowed for short periods by poor students. Other items include a UPS unit, and miscellaneous long cables with connectors to enable wired input devices to be passed around and shared by children in a classroom for interactive participation.